Okay, so I owe you all an update. And I promise to get right on that, as soon as I can stay in one place long enough to write one. Too many meetings and other obligations have kept me on the run the past couple days. And tomorrow doesn’t promise to be any easier, thanks to a morning press conference when I’m usually still checking the news, petting the Corgi — and no, that’s not a metaphor, even if it does sound vaguely dirty — and working on my second cup. Then again, if you’re not busy Thursday morning, you might want to head to the 7th Street side of MacArthur Park at 9:30 am when the mayor will be hosting a press conference to announce something that would have been unthinkable just a few years ago. And yes, it’s good news. And no, I can’t tell you. Even if others have been leaking the news everyone was supposed to keep quiet. I promise to fill you in later. In the meantime, if you can’t wait, check out L.A. Streetsblog after 9:30 am when Damien will break his paternity leave long enough to spread the good news. And maybe even quote yours truly if he can make heads or tales out of that rambling statement I gave him. Meanwhile, here’s a perfect example of the benefits of defensive riding. I often see cyclists run the red light where the Marina bike path crosses Admiralty Way, for no apparent reason. Especially since there’s seldom a long wait there. Then again, it’s not unusual to see drivers run it, as well. Most go through just after the light has changed. Which is why I make it a policy to wait an extra second or two to be sure that everyone is going to stop before I cross. Then there’s this jerk, who blew through without slowing down, several seconds after the light had changed, and while I was already crossing the street. If I hadn’t taken those few extra seconds, I might have been right in front of him. Not that I think that would mattered to the driver, who seemed to be a hit-and-run waiting to happen. Cyclists are constantly criticized for cutting off drivers. And yes, some of it is justified. On the other hand, many drivers don’t think twice about cutting off a cyclist, casually pulling out in front of a rider with the right-of-way, as if we don’t have any right to the road. A recent ride last week seems to illustrate that perfectly. In the course of a few short hours, I was cut off by four separate drivers in four separate incidents. And none seemed to think it was any big deal. None drove aggressively. None seemed in a particular hurry, or even seemed to take much notice of my presence on the road. First up was a driver who made a left turn across my path, without ever looking in my direction. And at the base of a hill where I usually reach 25 mph; fortunately, I began feathering my brakes as soon as I saw him, just in case he did something stupid. Like not even noticing me until he was passing me. Then exactly one block later, I was about to cross Westwood Blvd when one driver turned left in front of me, with plenty of time to clear the intersection before I entered. Unlike the driver behind him, who casually followed the first through the intersection, even though I was already crossing it. And this one definitely saw me. You can see me point at her in an attempt to get her to wait; what you can’t see is the driver sarcastically pointing back at me. In other words, she knew I was there. And just didn’t care. An hour or so later, I was waiting on the light at Washington and Pacific, with cars in the lane behind me, and others lined up in the right turn lane next to me. Yet when the light changed, the driver attempted to make a left directly in front of me. Or more precisely, through me, since I foolishly assumed I had the right-of-way once the light changed. I have no idea whether he actually saw me before he turned directly towards me. But he had to have seen the cars behind me, and known it wasn’t his turn. Or smart, for that matter. Finally, there was the driver on Montana in Brentwood who passed me, then casually cut in front of me to wait for a parking space. Never mind that I was riding at the edge of the traffic lane, just outside the door zone. She clearly knew I was there, having just passed me. And clearly, my presence didn’t seem to make any impression on her. The drivers who cut you off because they don’t see you. Or the ones who do, and do it anyway. Then again, the other major complaint against cyclists is how casually we run stop signs. While New York continues to crack down on scofflaw cyclists, a study shows 60% of cyclists and pedestrians killed in the city over a 15 year period resulted from motorists breaking traffic laws — most of which weren’t prosecuted. 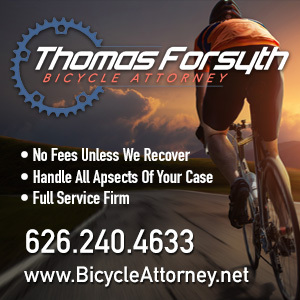 Pasadena-based bicycle attorney Thomas Forsyth — you’ll find him over there on the right — has developed a new iPhone and Android app to help walk you through the steps to follow if you’re ever in a collision. It wouldn’t hurt to download it just in case. I’m not much of an app user myself; I still suffer from that antiquated notion that phones are annoying devices best used for making and receiving calls. But if anyone would like to try it out and write a review, I’ll be happy to post it on here. Metro is sponsoring a free family bike ride on Saturday, September 8th. 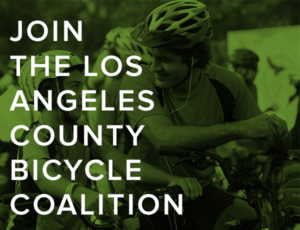 Don’t miss next week’s meeting to discuss a possible CicLAvia to the Sea. B.I.K.A.S. deconstructs the new US bicycling postage stamps. 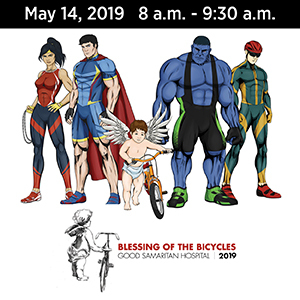 Flying Pigeon hosts the Spoke(n) Art Ride this Saturday. L.A.’s soon-to-be bike share provider now has a new blog; thanks to LADOT Bike Blog for the link. Better Bike takes a detailed look at Beverly Hills bike collisions. 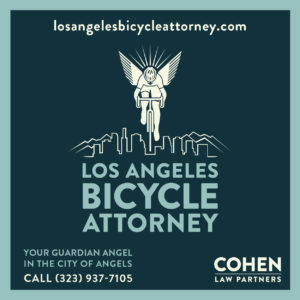 A Santa Monica cyclist is challenged to fight by a group of men who cut him off in a car, then steal his bike when he calls 911; if you know the victim, I know a lawyer who wants to help. KPCC looks at the non-Olympic sport of bike polo, and offers video of Wolfpack Hustle’s recent midnight drag race. Advice on riding in hot weather; my suggestion is to buy insulated water bottles, and put them in the freezer before you ride. Long Beach’s bicycling expats, who seem to have taken up at least semi-permanent residence in Portland, have published The Unauthorized Brompton Touring Guide, available as an ebook. Upcoming Calabasas bike-centric restaurant and coffee roaster Pedalers Fork introduces their new team kit. OC bike advocate Frank Peters is interviewed for an online radio show, while Mrs. cdmcyclist walks away — or rather rides — from a tumble. Del Mar residents will vote on whether to make their downtown more livable, or keep it a gridlocked mess. An annual, but unofficial, bike ride gridlocks Santa Barbara when over 1,000 riders show up. A Corona teacher plans to give away 155 bikes to disadvantaged children. Cyclist survives a 40 mph hit-from-behind collision when a driver removed his shirt while driving to wipe sweat from his eyes; no, really, that’s what it says. Riverside County discusses a multi-use trail from Temecula to Idyllwild, featuring a 4,000 foot elevation gain. The Imperial Valley Press profiles the weekly Mexicali ride in Calexico, and a 78-year old cyclist who’s still going strong. How to transport a small mammal by bike. As others have pointed out, roads were not built for cars; evidently, railroad tracks weren’t, either. Bicycling says coffee can help you bounce back from a hard ride, if you drink enough of it. A publication on governing says cities need to protect cyclists and pedestrians. A tossed beer can reminds the publisher of Tucson Velo just how vulnerable cyclists are. Chicago cyclists will get 34 miles of protected bike lanes before the end of the year; as far as I know, L.A. cyclists still don’t have any. A Minneapolis driver admits to running over a cyclist and fleeing the scene. A Vermont rider is injured in a left cross collision when a driver turns in front of four — yes, four — cyclists, but claims he never saw any of them. A writer for Reuters says the recent ethical case for running red lights is morally indefensible, while the Atlantic Cities looks at why riders do it. A volunteer Brooklyn bike patrol escorts women safely to their homes. New York bike thieves are stripping ghost bikes for parts. If this is all you have to say about ghost bikes, why bother? Chattanooga-based LiteSpeed Bicycles helped build the new Mars rover. A Virginia driver is indicted for felony hit-and-run in the death of cyclist last week; the driver claims he thought he hit a deer, though he has at least a dozen other moving violations over the last 10 years — so why did he still have a license? The Virginia Bicycling Federation looks at proper lane positioning; I like the way the LAPD puts it — ride where it’s right, not to the right. A Florida man is charged with two counts of first degree murder for running down two cyclists while trying to escape from police; his alleged accomplice has also been arrested. The World Anti-Doping Agency tells the UCI to back off in the Lance Armstrong case; the current cat fight between doping agencies is more interesting than the case itself. It’s all about the bike in the UK right now, as the Royal Mail honors the country’s many, many gold metal winning cyclists. Evidently, cycling really is dangerous, as a superfan dies while watching track cycling at the Olympic velodrome. The UK’s Southampton Cycling Campaign calls for strict liability for drivers who hit cyclists. The Guardian calls for bicycling proficiency to be required to get a drivers license; best idea I’ve heard in a long time. A new book traces a mythical bike race through the streets of London in highly detailed illustrations. South Africa considers banning bike trailers for no apparent reason. Finally, after a cyclist runs a stop sign, a road raging driver chases him down to yell at him, then uses her car as a weapon to cut him off. And brags about it online. Of course, it’s not the first time the bike-hating writer had taken all cyclists to task for the actions of a few. Or one. And a London rider watches as a truck driver forces a cyclist off the road, then admits to doing it on purpose.